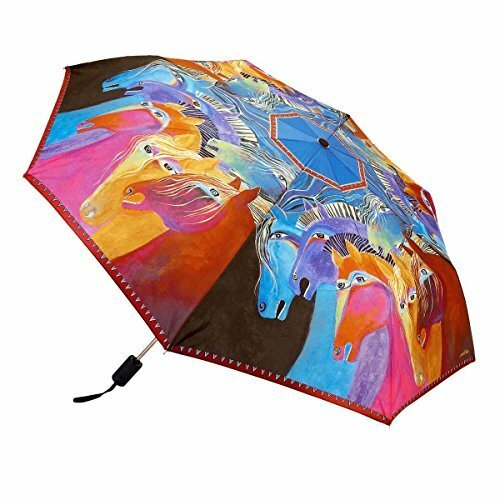 This compact umbrella has a colorful Laurel Burch design on 100% Pongee. 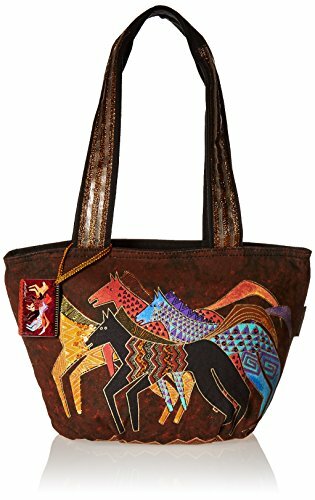 LAUREL BURCH-Medium Tote Zipper Top: Native Horses. The brilliant hues and wonderful patterns of these carefully designed totes appeal to everyone. They are artful and useful at the same time! This package contains one 9-1/2x14 inch zipped bag; one inside pocket with zipper and two twenty-four inch handles. Imported. LAUREL BURCH-Shoulder Tote: Wild Horses of Fire. These Laurel Burch totes are designed with her magically uplifting whimsical creatures. The bright colors; fun images and the practical construction of these totes make them popular all over the world. This package contains one 15x19x7 inch tote with glitter and bead accent; removable bottom support; inner zipper pocket; canvas straps and a wood charm. Imported. LAUREL BURCH-Travel Bag: Wild Horses Of Fire. The bright vivid colors and whimsical creatures that are the signature design of artist Laurel Burch adorn this canvas tote that is both a practical bag and a beautiful piece of art. This 15-1/2x21x8 inch Travel Bag features one main zippered compartment; a removable bottom support panel; three small inner pockets (one zippered and two pouch); a pouch-style pocket on each outside end; two strap handles; six wooden feet on the bottom; and a wooden charm. Imported. LAUREL BURCH-Cosmetic Bag Set of Three: Moroccan Mares. The brilliant hues and wonderful patterns of these carefully designed totes appeal to everyone. They are artful and useful at the same time! This package contains three zipped bags ranging from sizes 4-1/2x7-1/2; 5x9 and 6-1/2x10 Inch. Imported. 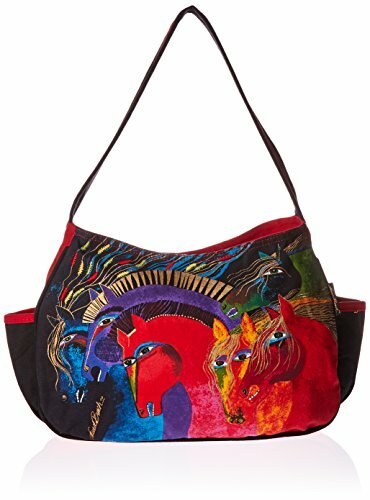 LAUREL BURCH-Medium Hobo Bag: Wild Horses Of Fire. The bright vivid colors and whimsical creatures that are the signature design of artist Laurel Burch adorn this canvas tote that is both a practical bag and a beautiful piece of art. 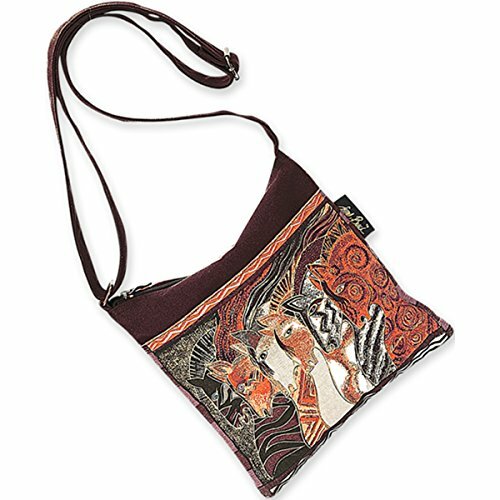 This 9x14x4-1/2 inch Medium Hobo Bag features one main zippered compartment; a removable bottom support panel; one small zippered pocket inside; a pouch-style pocket on each outside end; one strap handle; and a wooden charm. Imported. 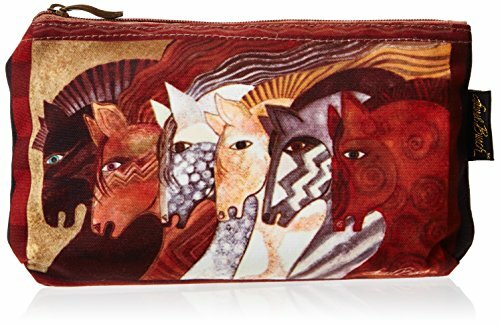 LAUREL BURCH-Cosmetic Bag: Mythical Horse. 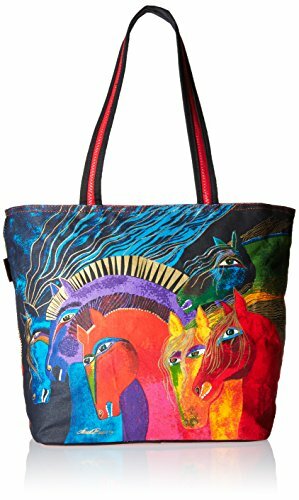 The bright vivid colors and whimsical creatures that are the signature design of artist Laurel Burch adorn this canvas tote that is both a practical bag and a beautiful piece of art. This 6-1/2x9-1/2x1 inch Cosmetic Bag features one main zippered compartment. Imported. Laurel Burch-Crossbody: Moroccan mares. The brilliant hues and wonderful patterns of these carefully designed bags appeal to everyone. They are artful and useful at the same time! this 10- 1/2x10 inch bag features one adjustable strap and one outer pocket with a snap closure. Do not wash-spot clean only. Imported. Looking for more Laurel Burch Horses similar ideas? Try to explore these searches: 130 Rough Service Medium Base, Oakley Khakis, and 1.6 Head Gasket Kit. Look at latest related video about Laurel Burch Horses. Shopwizion.com is the smartest way for online shopping: compare prices of leading online shops for best deals around the web. 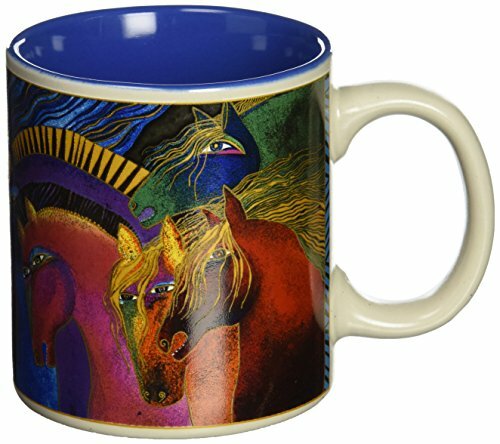 Don't miss TOP Laurel Burch Horses deals, updated daily.